We have been assured that things are on the mend with Johnson. If that is the case, the senator might consider a news conference or an occasional press release to assure those of us who are represented by him that he is in fact on the road back to productivity. My suspicion is that the senator's condition is much more serious than he or his staff has seen fit to admit. This South Dakotan is not comfortable when elected officials put themselves and their ideology above the best interest of those they represent. This is a tough one to comment one, because I think the author (Randy Amundson) comes off as harsh, and maybe a bit insensitive. But on the other hand, a few points he tries to make are valid. This rippled through Republican politicos yesterday. Just a bit. candidate is current Lieutenant Governor Dennis Daugaard. together in the state Senate. Go read KCCR News here. Wow. This is early, but not entirely unexpected. "HATES CRIMES" LEGISLATION PASSES U.S. HOUSE"
"UNEQUAL" PROTECTION UNDER THE LAW"
New Holland , SD - Concerned Women for America (CWA) of South Dakota regards the passage of "The Local Law Enforcement Hate Crimes Prevention Act" (H.R. 1592) as troubling for all citizens and for the integrity of the United States Constitution. What about those other groups? Herseth denies hate crime protection to vets and seniors. A bill was introduced in the United States congress recently to provide additional funding for the prosecution of hate crimes. HR 1592 the `Local Law Enforcement Hate Crimes Prevention Act of 2007', protects several groups of people in an effort to protect against violence based on "perceived race, color, religion, national origin, gender, sexual orientation, gender identity, or disability of the victim." Recently, Republicans offered an amendment to this legislation to expand on who would be protected to include veterans, soldiers, and senior citizens as a protected class under the Hate Crimes bill, since sometimes people in those classes are victims of violence because of their status. Great. That's just great. DMV creates a free speech martyr. Let me just say, I couldn't agree less with the message on the license plate in the following story. I couldn't agree less. But then, someone over at DMV decides, "let's take a minor annoyance, and turn it into a news story on free speech." For several days. That will probably hit the national press. Don't hold it in. Tell us what you're really thinking. Former Governor Bill Janklow had a full page advertisement in the back of the Capital Journal today praising recently retired GFP chief John Cooper. He praised Cooper for his many years of distinguished service in an often thankless job. But that's not what got my attention. The Sioux Falls Argus Leader, a former journalistic enterprise now essentially reduced to being a medium for advertising flyers, marked John Cooper’s recent retirement by offering a story that began: “Man of integrity or lying scum?” The newspaper quoted a chorus of John’s critics, including one, who, after admitting, “I don’t know him personally,” did not let that ignorance stand in the way of pontificating about his professional career. Banking the benjamins instead of spreading it around. Rounds says the state has given schools an extra 30 million dollars in the last four years while school districts have increased their budget reserves by 31.5 million dollars. Even though some believe the Republican gubernatorial race will add up to a herd of candidates, political handicappers say it won't be as many as once thought.Most often heard in the speculation of "definite" candidates is Daugaard, state Sen. Dave Knudson, former House Speaker Matt Michels and former state Sen. Lee Schoenbeck. Political observers say Knudson and Schoenbeck seem to be making the most inroads. July 1 will tell whose got the money advantage. Sen. Scott Heidepriem continues to be regarded as the only "sure bet" candidate to seek the Democratic Party gubernatorial nomination.Read it all here. That’s why it’s disappointing that aldermen have been bickering among themselves over, of all things, phony e-mails being sent to the council and mayor. What’s worse is that they talked about the bogus e-mail matter — and thought they had it resolved — in executive session — closed to the public. The exclusion of a Catholic-school team from an invitational track meet at Sioux Park on Tuesday has raised a public discussion about allegations of sports recruiting that have been muttered in private for months. It also prompted a flurry of phone calls throughout the day Tuesday between officials for the Rapid City School District, the Rapid City Catholic School System and even Bishop Blase Cupich that will lead to a group meeting on the issue later in the week. What happens when you lose an election in South Dakota? Many people take some time off to reflect on the controversies, the continued and extended political battles, and the warring between the political parties. Bryce Healy has gone from a job dealing with education funds to a job advocating for educators. Healy officially today starts his new job as the executive director of the South Dakota Education Association. The organization, which represents more than 7,000 educators statewide, is based here in Pierre. That challenge, Healy says, will include making sure SDEA works with other educational groups on issues during the legislative session. Healy says cooperation is the key. There are at least two obvious reasons that some Republicans want Dusty Johnson to run for the U.S. House of Representatives in 2008. In a 2004 campaign for a relatively obscure post in state government, he won more votes and raised more money than the 2006 Republican candidate for South Dakota’s House seat. Johnson, a Mitchell resident, won a spot on the Public Utilities Commission in 2004. In doing so, he garnered 196,974 votes and reported receiving $194,905 in campaign contributions. Conversely, Bruce Whalen earned 97,864 votes and raised $150,447 last year in his failed bid to unseat Democratic U.S. Rep. Stephanie Herseth Sandlin. South Dakota Democrat to run for President. No, Tom isn't getting into the race. I noted it in passing that a South Dakota Democrat has entered into the Presidential Primaries. And it wasn't Tom Daschle. Although, none of the other South Dakota Democrats seem to be endorsing this long shot candidate, as they've signed on with Obama in the case of Tom Daschle, or Edwards who has Congresswoman Herseth's support, or any number of other presidential hopefuls. Dang them for picking someone who has a snowball's chance in hades. 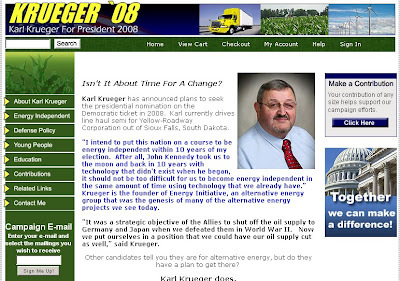 Because Karl Krueger is in the house:Could the next president of the United States have been at the 2007 Mid-America Trucking Show? Not likely. But truck driver Karl Krueger, a self-described conservative Democrat, is going to give it his best shot. One of his catches: He won't accept any campaign donation more than $50. The Tim Johnson issue is still out there like this white elephant. If you can't tell, The Tim Johnson issue is still out there like this white elephant. It's there, and we don't know how to handle our feelings on the matter. One one hand, we want him to get better. On the other...... well, as illustrated by the Yankton newspaper, we're starting to ask questions. The Rapid City Journal came out this morning, and was the perfect illustration of why the way his staff is handling this is getting to be irksome to the people of South Dakota. Yesterday, I noted how I hope the guy gets well, and does so quickly. I do, I really, really do, because I'm in the position where I have a child who is receiving rehabilitative services. But at the same time, I'm not keeping my daughter sequestered as his staff is. Julianne Fisher said there’s little doubt that Johnson, who is mentally sharp, will be back in his office and back casting votes on the Senate floor. Rapid City School District punishes the Catholic Kids. Why? Because they can. In the Rapid City Journal this morning, there's a Kevin Woster story how the Rapid City School District disinvited the St. Elizabeth Seton Junior High school team who had regularly attended the event because they thought the people at the Senior High might have been recruiting athletes. And the school district isn't saying why they're exhibiting their bias against the catholic school. Just that they are. The Seton team, which is part of a Rapid City Catholic School System that includes St. Thomas More High School, was not invited to compete at the popular middle-school meet this year. That was a break from tradition that Catholic-school coaches and administrators suspect could be payback over allegations of improper recruiting of athletes by Thomas More. Yankton Press and Dakotan Poll: Will he or won't he? Who are your top two picks (either party) for the 2008 US Senate, and the 2008 Congressional Race and why? "As I continue with my therapy, I also get more and more work from the office," he said. "The doctors tell me to pace myself and prepare for the long road, but I am determined to get back in the saddle." Johnson will continue speech, physical and occupational therapy five days a week for several hours each day on an outpatient basis, according to the statement. Robotic treadmill training is an important part of the senator's recovery, according to Dr. Michael Yochelson, director of brain injury programs at the National Rehabilitation Hospital.Read it all here at ArgusLeader.com. While I'm sure our politics may disagree on many points, I do hope his continued recovery is successful. Until someone mentioned it to me today, I don't think I had ever heard this one before. As I'm told, this last year in the Sioux Falls Mayoral race, candidate for mayor Vernon Brown (also on the city council) had an endorsement radio ad done for him in the contest by the Rapid City Mayor Jim Shaw. (UPDATE - I'm hearing that it was NOT Vernon Brown - it was Darrin Smith. My Bad -pp). Fast forward a year later.... And the embattled mayor is not Dave Munson, who survived the contest, but Rapid City Mayor Jim Shaw who is coming off of a string of controversies, including his very public arrest down at the Iowa State Fair. So are we going to see any payback? Will a Sioux Falls councilman do an advertisement for Shaw? Or will Mayor Munson's phone start ringing with various Rapid City mayoral candidates asking him if he "remembers that ad that Jim Shaw did?"